Tired of getting in your own way? Don't like being told what to do? Want to be successful while being true to you? This is the book you've been waiting for. 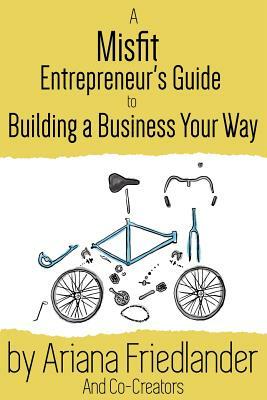 A Misfit Entrepreneur's Guide to Building a Business Your Way will make you laugh, think, and reevaluate everything about your entrepreneurial journey, while showing you that you're not alone. Most importantly, it will guide you in charting your own path from where you are to where you want to be. "Original, witty, and inspiring. No one has been ambitious or daring enough to write a book like A Misfit Entrepreneur's Guide until now. This is a must-read for Misfit Entrepreneurs everywhere." -Jonah Berger, Wharton professor and bestselling author of Contagious: Why Things Catch On "Anyone who meets Ariana is instantly struck by her thoughtfulness, knowledge, and humility, and these values are clearly captured and communicated in this book. Through her well-crafted collection of journal entries, stories, and experiences, she paves a path showing what's involved in being an entrepreneur. These lessons, successes, and challenges provide inspiration, motivation, and real insight into how to manage yourself and your business while exploring the uncertainty associated with new ventures. She constantly reminds us that being a 'misfit'-and learning to become comfortable with it and yourself-is really what the entrepreneurial journey is all about." -Barry O'Reilly, founder and CEO of ExecCamp, co-author of Lean Enterprise: How High Performance Organizations Innovate at Scale "Remarkable. Practical. Inspirational. Ariana gives us a 'behind the scenes' look at the trials and tribulations of the Misfit Entrepreneur's journey to mastery. Want to chart your own path? Read A Misfit Entrepreneur's Guide. Get ready for wisdom and insight that will catalyze your growth and transform you into a successful and satisfied entrepreneur." -Jason W. Womack, MEd, MA, cofounder of Get Momentum About Ariana Friedlander Ariana Friedlander, MPA, is a community organizer, social entrepreneur, lifelong learner, the founder and principal of Rosabella Consulting, and the creator of EntrepreNerds(TM). She works with leaders doing business as unusual, and she specializes in fostering positive change within organizations of all shapes and sizes. She is an award-winning thought leader in experiential education, leadership development, productivity, and conversational intelligence. She earned her master's degree in organizational leadership from the University of Delaware. Ariana Friedlander, MPA, is a community organizer, social entrepreneur, and the founder of Rosabella Consulting. She works with "leaders doing business as unusual" and specializes in fostering positive change within organizations and companies of all shapes and sizes. Ariana's unique coaching and facilitation style prompts collaborative conversations by modeling shared leadership. Specific areas of expertise include: experiential education, leadership development, lean startup, productivity, and conversational intelligence. Ariana made Northern Colorado's "40 Under Forty" list in 2015 and received the fourth annual Quid Novi Award for Innovative Thought. She earned her master's degree in organizational leadership from the University of Delaware and has a bachelor's degree in medical anthropology from Hampshire College, in Amherst, Massachusetts. Ariana lives in Fort Collins, Colorado with her family.